Who would ever forget the massive and deadly flash floods that swept away millions of houses, rendered 20 million people directly affected by the devastation so caused. A large number of people still live in tents, not tattered and torn, as they have no money to rebuild their houses or the lands where their houses once stood are still inundated or marshy to go back to. 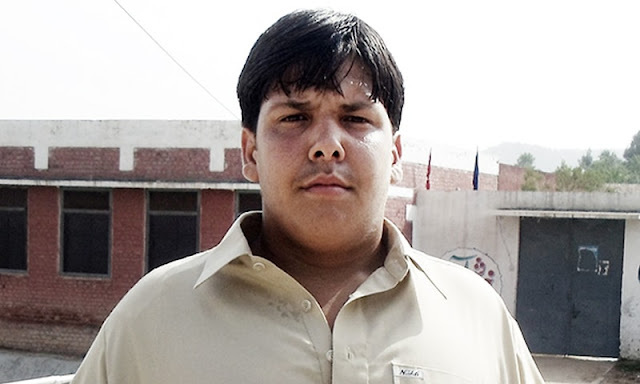 Even the media and the government seem to have forgotten them. But the floods have also developed strange phenomena in parts of the Sind province, the southernmost province of Pakistan. 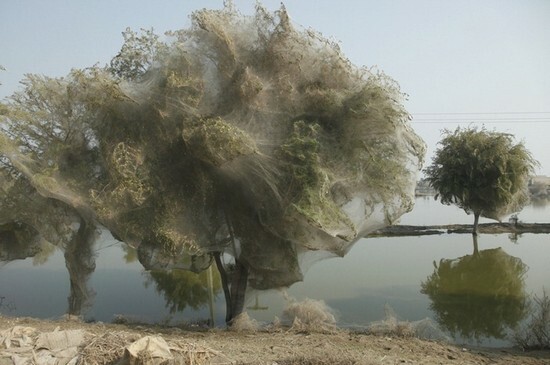 Over a period of time, the trees in areas still under water have started to wear a different attire – a creepy and a cocoon like net has started to be weaved around the trees. And by and by they covered the entire trees, making these look like part of some horror movie. 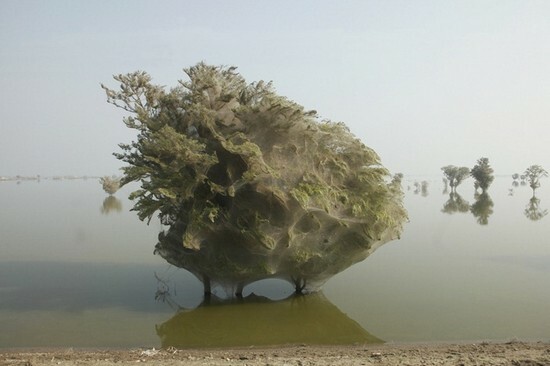 When researched and analyzed, it has been found that the spiders in the area, fleeing away from the flood waters moved up into the trees, and since the trees still remain submerged in waters, they have no place to go. So they continued to weave their web over and over again around the trees, making these look like giants standing in water. For the locals this is a unique experience as such things has never happened before. This has also taken the environmentalists by utter surprise as such are the rare finds ever to be witnessed anywhere else in the world. 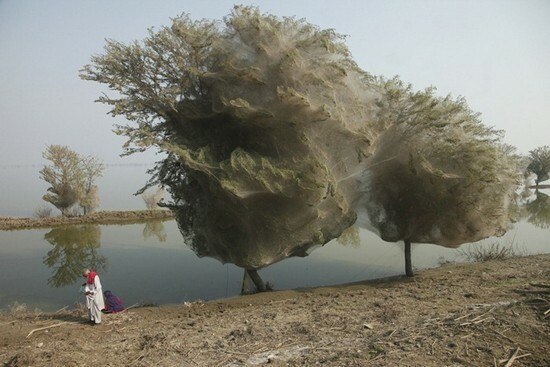 For the locals, this phenomena is also a blessing in disguise as the mosquitoes are inadvertently attracted towards these mysteriously shrouded trees and get trapped for the spiders to devour healthy three times meal.